TS EAMCET Hall Ticket 2019: Jawaharlal Nehru Technological University (JNTU), Hyderabad on the behalf of TSCHE will schedule an entrance exam for candidates seeking admission in the field of Engineering & Technology, Agriculture & Medicine (Pharmacy, Veterinary etc). To get entry in exam hall, you will have to carry TS EAMCET Hall Ticket to the examination center. Here we have shared the tips to download the hall ticket from the official website through the online process. Candidates who wish to download their Telangana EAMCET admit card need to check the tentative schedule of TS EAMCET 2019. Here we have provided the exam dates along with the date of issue of admit card. Go to the “Application” section and click on “Download Hallticket”. Enter the Registration Number, Qualifying Examination Hall Ticket No, & Date of Birth. Click on “Get Hallticket” button. The “TS EAMCET 2019” admit card will be shown on the screen. 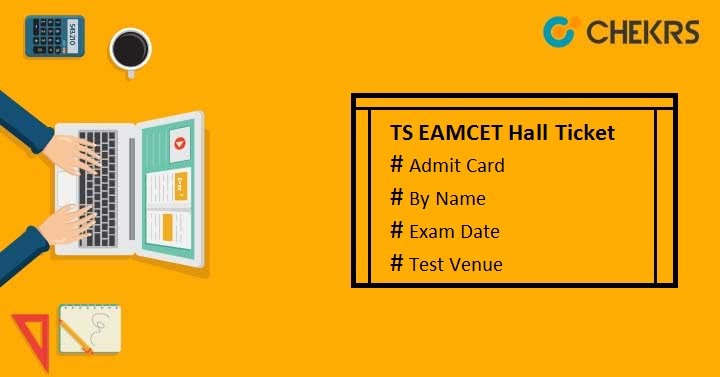 TS EAMCET Hall Ticket is the most important document which a candidate needs to carry at the examination hall because it contains candidate’s details and without this the entry of candidates will be prohibited. Candidates also need to bring their filled-in online application form along with the affixed recent color photograph, certified by gazetted officer or principal of the college. Applicants are required to bring attested copy of caste certificate (if applicable). Candidates are advised to read all instructions printed on the admit card and adhere them otherwise you may be barred or disqualified from the exam. Please examine all the details printed on the TS EAMCET 2019 Hall Ticket. In case of any discrepancies, report to the TS EAMCET Helpline center for necessary action. Students who are going to appear in TS EAMCET 2019 exam and they are still unaware about the exam pattern may check TS EAMCET Exam Pattern here. For further enquiries, please contact us by sending your question in below comment box. We will respond to you soon.